It’s wine o’clock somewhere! GoodWorks Entertainment and Pink Pledge To Benefit The Norma Pfriem Breast Center, in partnership with The Park City Honey Co., invite all wine aficionados to swirl, sip, and savor at their second annual wine festival, Fairfield Uncorked Wine Festival (FKA Flavour Wine Festival)! The event will directly support Pink Pledge To Benefit Norma Pfriem Breast Center (now in their 4th year), a month long, community wide, awareness and fundraising campaign that enables the Center to continue to provide medical excellence and compassionate care to all women regardless of their ability to pay. 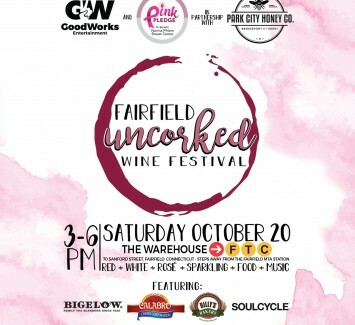 Fairfield Uncorked Wine Festival will feature interactive opportunities to further benefit Pink Pledge. With over 150 wines from all over the world, local business showcasing their specialties (Bigelow Tea, Calabro Cheese Coporation, Billy’s Bakery, and SoulCycle), and Napa Valley- like ambiance….the only question we have is wine not?! Early bird pricing ends 8/8.